Here is a chart of the US Dollar that tells a clear picture. It’s relation with Gold can be seen as opposite. The following is latest charts on copper and Baltic Dry Index. Copper tried to rally stopping at 2.10 back down to 2.02. In the weekly longer term, it has been consistently down over last 3 years. and for the Baltic Index, it keeps reaching lower lows, now at 290. Looking at a longer term chart 2001 til recent, can see that it was once in 2007 at 11,400. Created primarily due to the drop in US Dollar as of December 2015. A much longer term shows that 2011 US Dollar appreciated and Gold would downtrend. What’s happening in China, is it still a good opportunity. What should I do for my future? I just finished my 2 year internship and am ready to pursue my dreams… (question by young professional in the architectural field – but applies to young professional). In my simple view of things, China, as a large Emerging Country, has gone thru the same process as the US in the early stages. If you read about the economic history of the US starting back in the mid-1800’s until 1980’s you will see some similarities (irrespective of the political system, I am speaking of economics – since you start to talk about business). China past 30 years were the first major up move in the long trend for China’s future. No major economy including the last 500 years (Spain – 200 years, England- 200 years then USA – 100 years) became great without its ups and downs. Neither have a seen any company including the ones I had been involved that went straight up and in fact some of the them only get better with great adversities. If you look back at your young life, you only get really good when you overcome a big problem. Big changes creates big people. Now China is in a correction and it will surely go to 2016. We are monitoring monthly what the federal government is doing and also keeping an eye on the problem areas like debt. China owes now 1/2 of the world debt. As bad as it sounds, when China owes that much money, the problem is more of the one lending it. Defaults would make lenders upset (especially if foreign lenders), however there is little you can do when the money is NOT in your hands. San Francisco (Bay Area and specially the Silicon Valley) is one of the best places on earth to be involved in business (highly experienced entrepreneurs and management, best innovation centers and plenty of capital). However, the major opportunities are in China. Nevertheless, the environment is rather immature (is beginning to mature). In addition, China will always be borrowing outside techniques and doing them the Chinese way. What you cannot discard is that in the long term, there are many major areas that are not exploited including the Tier 2 and Tier 3 cities. So, where you pick your cities, I believe is important to have a sophisticated city as a headquarter however that is not where the opportunities can be. We are in Shanghai and Shenzhen is a rival city, so is HK. Big firms are obviously in Shanghai and eventually everyone should have a HQ presence there. Not Guangzhou, even though I am Cantonese but I am a pragmatic person. Regarding business, for a young person like you, and before you make any major personal commitments, is best to develop and do as much as you can. This is the time you have nothing to lose and everything to gain. If you succeed widely, then nothing else has to be said. If you succeed midway, you will have moved closer to bigger success next time. If you don’t succeed, you would have learned something nobody can teach you. Not succeeding and making errors makes you just a more capable person, as long as you learn from your mistakes. There is not a successful person I know that has not made a big mistake in their career. Including Steve Jobs, Steve Wozniak (both of whom I worked with), and you name it. Even Warren Buffet, the richest man in the USA, for 10 years ran a company into bankruptcy. They all learned to get better. Steve Jobs had the worst out of Apple and Steve Wozniak had the easier path at Apple so you can see that Jobs go a lot bigger than Wozniak because Jobs had more struggle and problems than Wozniak. T. Boone Pickens (who mentored my son for a short time), was a billionaire in the 90’s and then lost almost all of it, their family abandoned him, wife divorced him and he ended up in the mental hospital to only do a comeback, reinvent himself and now has a net worth 10 times. etc… I could simply go on and on… Just make sure that whatever you do, you do some research and is what you believe in and like, and give it all. The other part of biz, is learn some basic accounting. I can give you some quick lessons. Good biz is knowing your numbers. some key numbers. It is NOT necessary to get an MBA. Actually, all successful biz people have less formal schooling than more. We are in a new generation as information is plentiful – too much sometimes. Besides, I personally having studied from academia for over 18 years, feel that I could have done with a lot less studying and more doing. Biz is all about having a goal, having a strategic plan, and taking decisive action. If in doubt, double the action. Jump over barriers and obstacles, go around the mistakes, keep moving and keep taking action. For their part, [Chinese] companies are being encouraged to engage in M&A to consolidate, cut costs and streamline. Find a partner. An old saying: “Don’t wait to be thirsty to dig a well” Is precisely what people who say they know a lot of Chinese Culture have forgotten to do. The article content reflects the situation today. We may be about to see what it’s like when big Chinese companies go bankrupt. After a weekend at China’s Central Economic Work Conference, Chinese officials have laid out details for what promises to be an excruciating reform period for its corporate sector. The report added that Monday’s measures will allow the market to play "a bigger role" in allocating resources and push under-performing businesses to exit the market. The high level of credit could weigh on China’s growth and financial stability. The efficiency of the investment financed by credit has been falling, with a commensurate drop in corporate sector profitability. This situation makes servicing debt obligations more difficult. "However, there is no formula on how much credit risk China’s financial market can handle by itself without plunging into a full-blown crisis," she added. I just came from a week long roadshow and speeches that showed what arrogance combined with ignorance does. Wenzhou and Fujian once called the Jews of China, has a group full of confused scared yet hiding under the disguise of a ostrich with their head in the hole. Ignoring good government advice and drink their sorrows away with more Baijiu. This is the best time to consolidate while the bosses are having a party and the balance sheets turns read, when they sober up they will ensure their companies are sold as their last resort for less than fair market. Thus, the old saying for best investment timing is “buy low, sell high”. An old saying: “Don’t wait to be thirsty to dig a well” Is precisely what people spoke say know deep Chinese Culture have forgotten to do. The present solar cycle as measured by the number of sunspots is number 24. 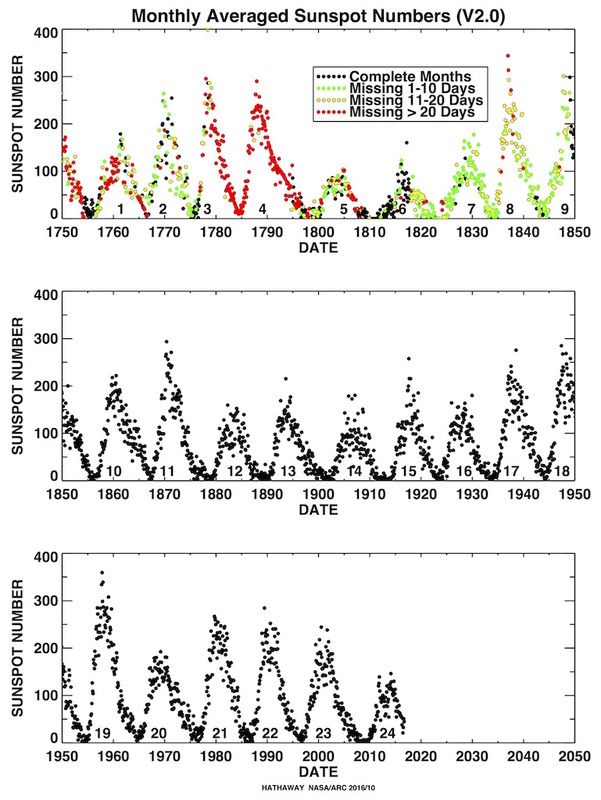 This solar cycle is the weakest of all sunspot cycles seen in 200 years (1815). The peak values (number of sun spots) is lowest count in 200 years. The first peak was reached 99 in 2011 and the second in early 2014 at 101. Prior to Cycle #24, the prior cycle (#23) lasted 11.6 years, beginning in May 1996 and ending in January 2008. The maximum smoothed sunspot number (monthly number of sunspots averaged over a twelve-month period) observed during the solar cycle was 120.8 (March 2000), and the minimum was 1.7. A total of 805 days had no sunspots during this cycle. Here is a group of photos showing the sun’s energy within a cycle. This cycle is from August 30, 1991 to September 6, 2001 (1991-2001). The sunspot cycle (#24) is the smallest seen in 200 years (1815) and in recorded history becomes the 2nd smallest with only the 1805 year cycle. How does the sun have an effect on commodity. The longest record for 400 years shows that the lowest recorded low period of sunspots occurred in the 1640-1720 time frame. It is worth noting the list of historical Grand minima of solar activity. These are around 690 AD, 360 BC, 770 BC, 1390 BC, 2860 BC, 3340 BC, 3500 BC, 3630 BC, 3940 BC, 4230 BC, 4330 BC, 5260 BC, 5460 BC, 5620 BC, 5710 BC, 5990 BC, 6220 BC, 6400 BC, 7040 BC, 7310 BC, 7520 BC, 8220 BC and 9170 BC. Since observations began, cycles have ranged from 9–14 years. Significant amplitude variations also occur during minima and maxima. How does the sun activity has on the Stock Market in the USA. Here are prices of copper over a 15 year period (2001-2015). This solar cycle is also the weakest seen in 200 years (1815). The peak values (number of sun spots) is lowest count in 200 years. The first peak was reached 99 in 2011 and the second in early 2014 at 101. 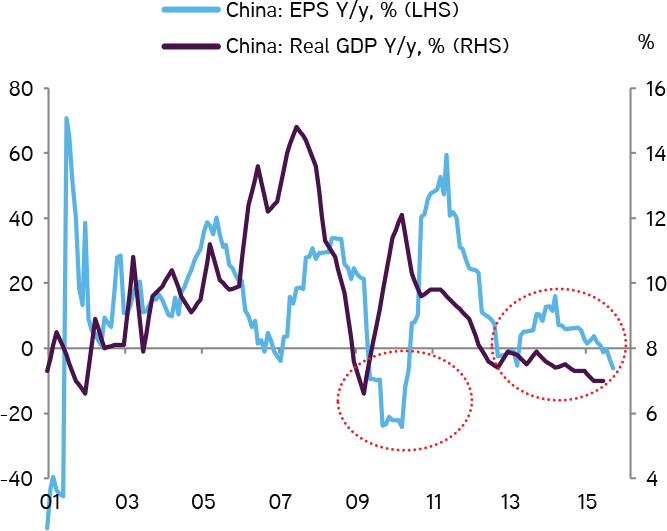 The business cycle downturn in China is now turning into a potential secular downtrend. The major correction expected is unwinding as we speak. While China is now large enough to manage the downtrend, other emerging markets in Asia ex-Japan, will see significant impact. China is still expected to be the bigger contributor to GDP growth in the world along with the USA. However, China has now join the group of less worst, at least for the foreseeable near term. In the macro world of economic status, we do have a global slow down and now China is included in it. 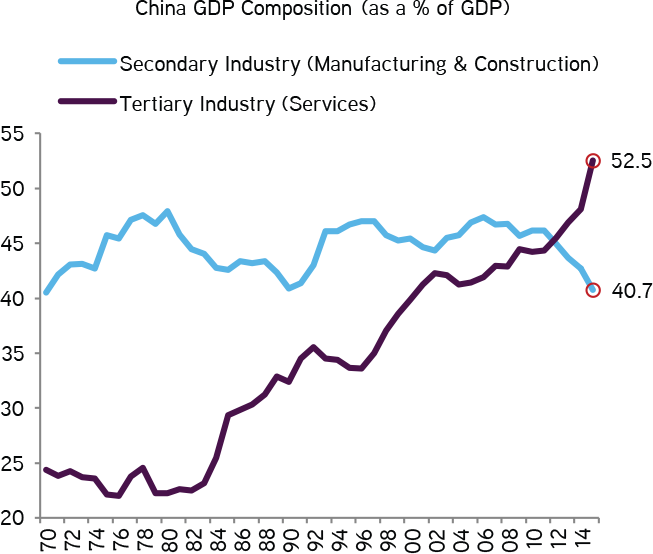 China businesses and the economy is in structural slowdown not just slower GDP. The profit margins is caving to the cost of debt excess and over capacity over an overall slowing global demand. 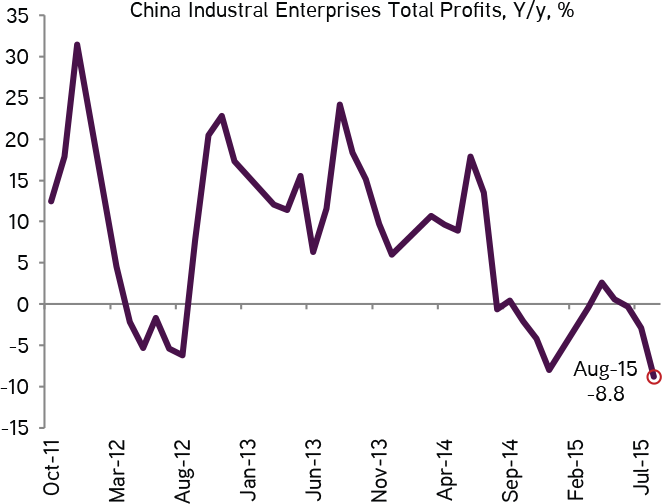 Slowing of the the GDP in China is a known theme by now, however, corporate profits are now becoming negative. Industrial profits declined 8.8% year-over-year in August, while the GDP was reported to be growing at 6.9%. Profits at the end is more important than sales and GDP. Due to matured penetration on brick and mortars consumer business and the slowing of income across corporate and personal incomes, e-Commerce is the choice for cost savings and convenience. The current slowdown sets up opportunities in the higher value-added services parts of the economy which have higher margins given lower profit margins. In particular, in the food safety, environmental services, and healthcare sectors. The masses are right at the wrong time! Emerging Economies Are Reshuffling. Asia ex-Japan in specific positioned on the global economy focusing on China’s strength. However, not having the size and scale of China, they now developing a systemic problem of enduring weaker growth, big deficits are building up and increasing political tensions is developing. This is especially true in Indonesia, Thailand and Malaysia. While all Asian economies ex-japan are highly leveraged in debt and excess – in a slowing global economy with a China slowing, the larger smaller and less sophisticated ones are highly exposed for debt reshuffling. Corporate and personal credits are at an all times high through out Asia and the risk of a debt bubble contraction is very high now. At the heart of all analysis, the global recession is amongst us. No matter China’s decades of miracle, with 1.4 billion population, the fact is that the world is much larger what China alone can do. With all major economies USA, Europe, Russia, Japan and the middle east and smaller ones like Venezuela and Brazil, it become one country against the backdrop of all others. 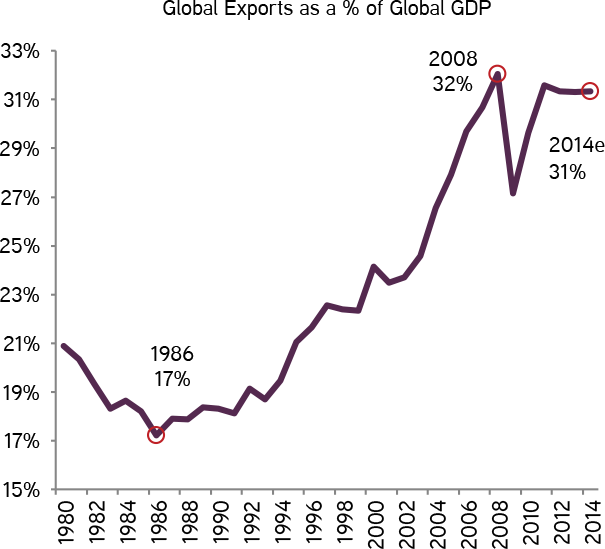 This graph shows that exports and the general global trade is having major problems from an overextended growth since 1986. It is now correcting in its own way. From the top down, China’s share in global exports is 13 percent, it’s foreign exchange reserves is 30 percent of global total and the usage of its currency in global capital flows is around 1-3 percent (still small). 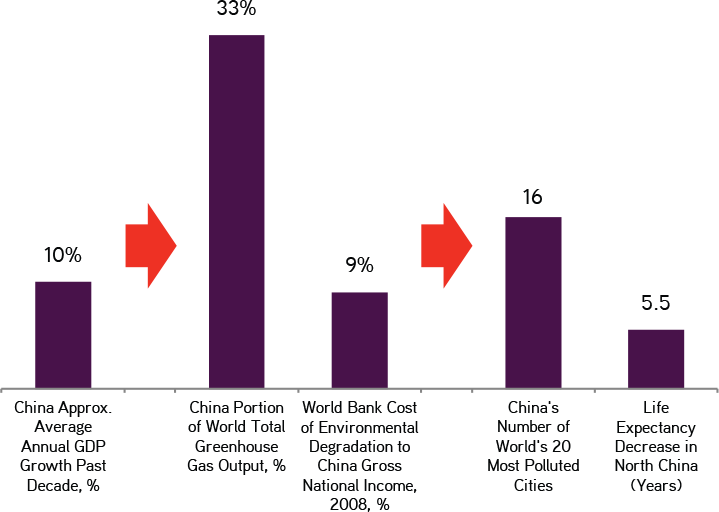 The past fuel for growth has been foreign direct investment and the majority of it was into Fixed Assets. However, Fixed Asset investment has been reduced nearly by nearly 66%. Fixed Asset Investment has continuously and rapidly come down from its peak in 2009. Because up until now, gross capital formation accounted for 46% of China’s GDP and as such it was the main driver for growth during the so called China Growth Miracle (from 2000-2011). There is practically no growth in Chinese exports which means profit loses due to high cost of fixed expenses. Here is detailed view to specific areas, some bright ones, others declining including large ticket items like autos. All of these reasons works against consumer purchasing. Now, prudence – and not excess – is back in fashion when it comes to consumer behavior. This is especially true for high end products but is it also impacts general merchandise. This graph shows merchandize purchased direct from factory versus in the secondary market. 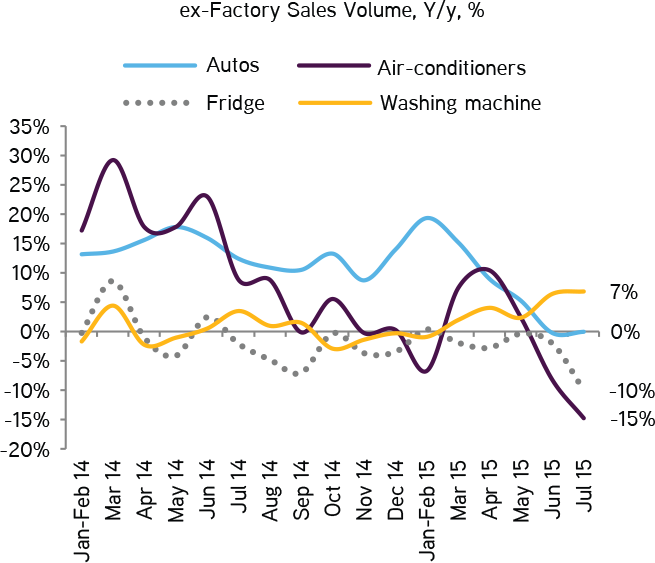 It also represents further deterioration in domestic demand for factory fresh products. This further affects factories that already do not have export demand, now have to cope with lack of internal demand. Worst of all, profits are negative. The lower GDP growth has been constantly trending down toward 7%, however now profits are turning negative and beginning to erase past gains since 2009 with the peak of profits margins in 2007. Lower GDP has been catching the headlines for over a year. The real untold story and what should be told is that the economy and businesses in general are now losing money and prior marginally profitable businesses are now un-profitable. 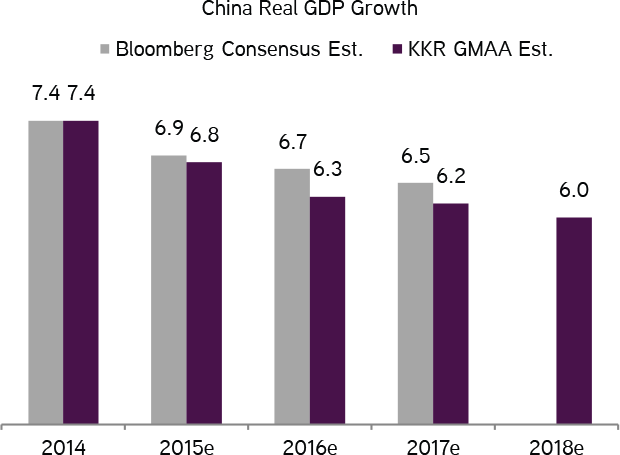 Major forecasting indices point toward secular down trending GDP growth for China down to 6% by 2018. The positive part is that the economy is still growing larger compared to USA and Europe in percentage terms year-to-year. Although, quality of growth has deteriorated into low or non-profit growth. 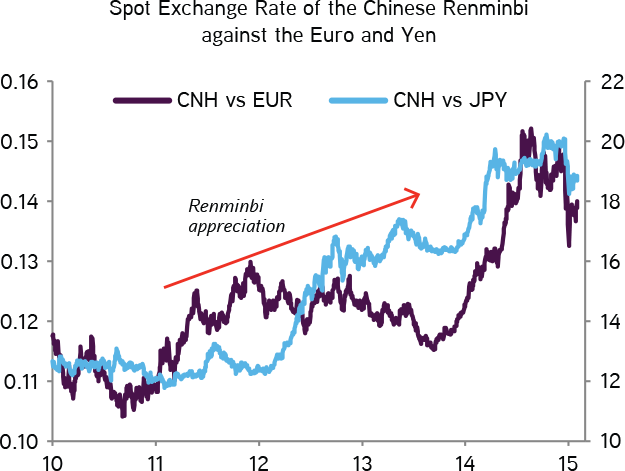 This year, Euro had 2 devaluations with direct consequences to RMB getting over valued in relative terms. This had the effect of making product and services from China 5-10% more expensive and a disproportionate 30% loss in competitive advantage by China to its rivals. We would expect the RMB to be readjusted in value over the next 12-18 months. 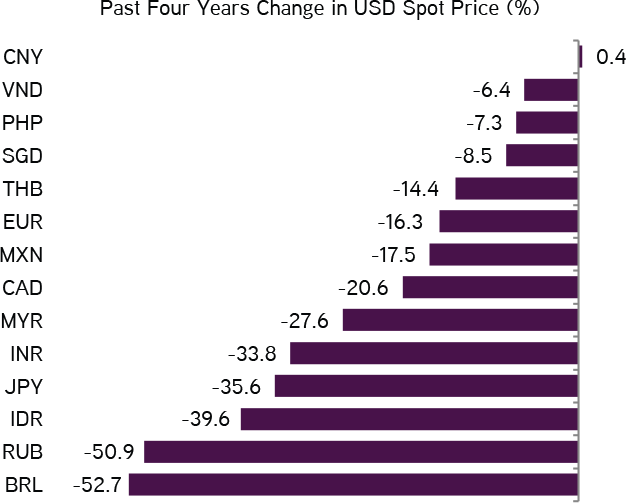 This chart shows that China’s RMB has gotten consistently more expensive while other major currencies value has been lowered. This includes USA, Euro, Japanese Yen. 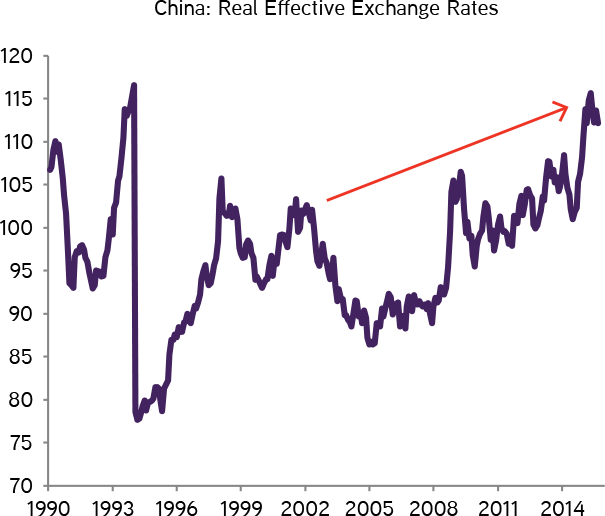 While there is a high likelihood China’s RMB would be devalued, there is also the possibility that other currencies will also be devalued. This includes Euro and other commodity dependent country currencies like Australia and Canada. In addition, Asian and South Asian countries that are suppliers and partners with China would also be affected by China’s economic slowdown. Up to 2011, China’s increased capital from a combination of profits, government revenues, and foreign investments, are beginning to see increasing negative outflows. 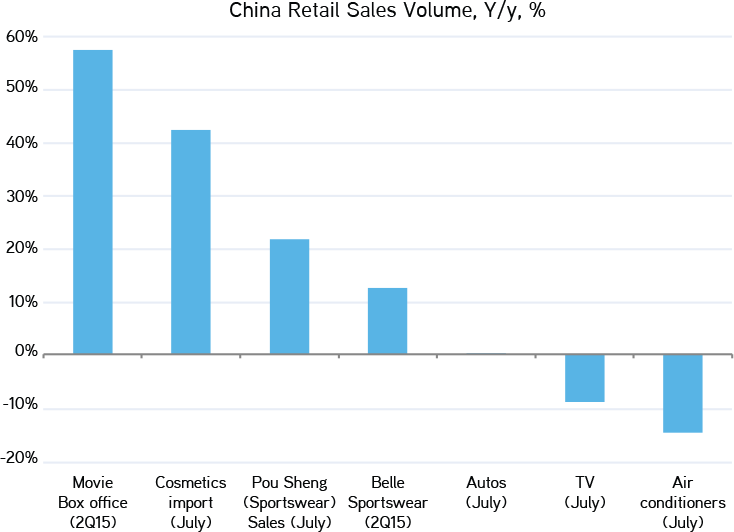 A small part of that are counter-directional investment as Chinese are beginning to invest abroad. 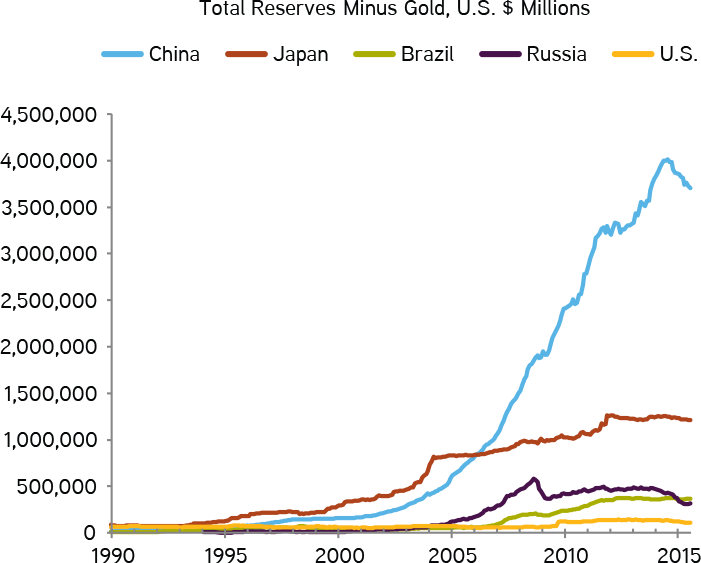 The is a growing amount out of the reserves used for non-productive purposes. 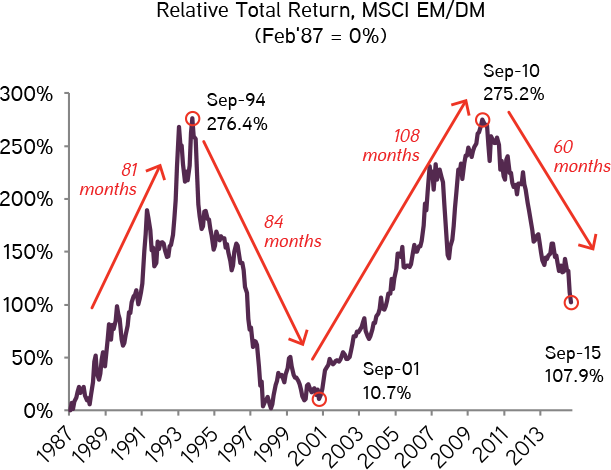 Downturns in the emerging economies has average 91 months (according to studies by Bloomberg, MSCI and KKR). Based on this, the minimum expected time left is 28 months from this writing (2 years and 4 months). In general terms, primary industries are to be avoided: mining, real estate and particularly manufacturing heavy ones. The Services industries remain attractive due to its higher margin and less dependence on exports and heavy capital burden. 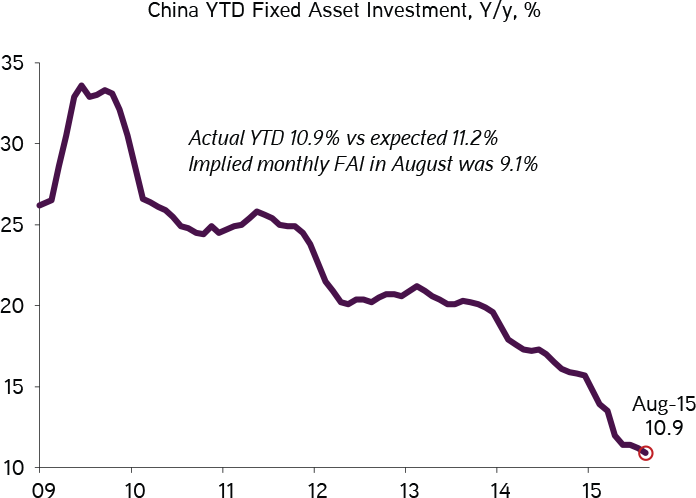 Given all the implications of a slower economy, there remains a single clear investment industry in China. Pollution control and cleaning. 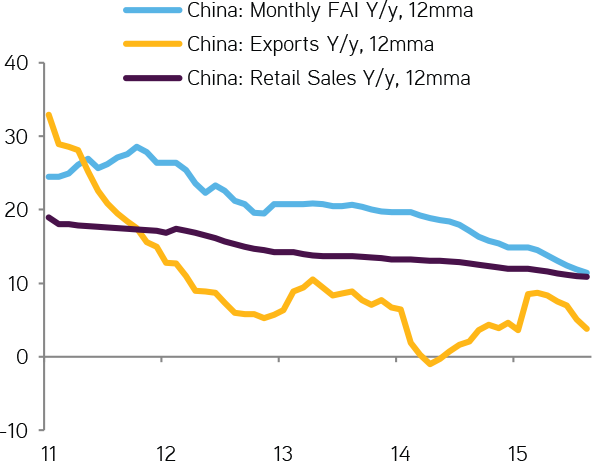 China national GDP has been coming consistently down in the past 2 years, not expected to be 6.9%. Here is a chart of 3rd Quarter, year over year (2014 to 2015), province by province. We can see that there are regional local provincial economies doing very well (above the average, 7%), such as Chongqing, GuiZhou and Tibet (11%, 10.8% and 9.8%, respectively). As a matter of fact, 24 provinces of 31 have growth above 7% leaving 17 below the average. Heilongjiang and Shanxi at the lowest range of 2.8% and below. However, the key economies composing 75% of the GDP (in 2014 order: Guangdong, Shandong, Zhejiang, Henan, Hebei, Liaoning, Sichuan, Hubei, Hunan, Fujian, Shanghai, and Beijing). And if the top 55% (Guangdong, Shandong, Zhejiang, Henan, Hebei, Liaoning, and Sichuan). The smallest 15 include the smallest (Tibet), Chongqing #21, Guizhou #26, Jianxi #18. Tianjin #17. Which are also some of the major percentage contributor to the growth percents above normal (7%). Essentially, 5 of the smallest provincial economies contribute above average (9%) with the largest 5 economies (in order of size: Guangdong, Jiangsu, Shandong, Zhejiang, Henan) to be above 8%. This leaves 21 provinces between 2.7% and 8%. Global trade remains down and especially as shown by transportation shipping. Industrial commodities especially the key industrial material used for growth economies, copper, is back testing its 2.22 low with treat to breaking lower soon. Based on forecast indicators, the economy remains weak for the immediate future with tendencies to go lower. The bottom does not appear to be in place yet. As expected, China will allow families to have 2 children instead of one. Birthrates have been declining and the population demographics is already reducing the labor force as more adults are reaching retirement age. This graphs shows the dramatic effect of drop in birth dates starting in the 60’s. Population Distribution in 2010, show a dramatic drop in future productive population (there is a large gap at this moment which will not be filled for 20 years). In comparison with a USA graph for 2014. As retirement reaches, there a new population peak that is beginning to enter the productivity age (25+). Copyright 2009-2014 Basilio Chen - All Rights Reserved. Private and Confidential. The material presented is solely the authors personal opinion. Any references, editorial or views are personal and for educational purposes or to provide a repository of ideas, and experiences. The author assumes no responsibility for actions taken by any person reading this Blog.